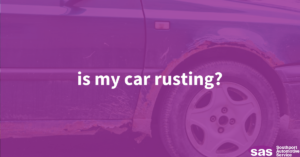 How Can I Tell If My Car is Rusting? The last thing someone needs with their car is corrosion — and for older cars (and some new), this is all too apparent to have at some point. However sometimes, there isn’t a clear-cut distinction of rust occurring, and these issues may only be pointed out by someone who can detect it. As an owner of your own vehicle, it’s important to know what to look out for — both cosmetically and mechanically. Below are a few way you can detect rust on your car and have it repaired before things become too big of an issue. Inspecting paint on older cars is a great way to check for potential rust underneath the surface. We know that in the harsh CT winters, salt and snow can cause corrosion a bit faster than the summer climate. Check for cracking or bubbling paint, which is a sign that something is underneath. Another sign might be cracked panels or deep scratches that made their way down to bare metal. Areas like this are the most susceptible to rust. Looking underneath your car is something you may not do too often, but it’s a good idea to at least once in a while. And familiarize yourself with what it looks like underneath. Where bare metal can take abuse from the climate and debris on the roads, rust can begin to accumulate. This is important to look at and identify, since rust can eventually turn to rot and damage the integrity of your vehicle. Take a look at your brake rotors after a rainstorm. There’s a good chance there is a bit of orange surface rust on the area — which isn’t necessarily bad, but it will give you an idea of what fresh rust looks like! Inspect the other areas of your car for this, and see if anything is occurring in areas it shouldn’t. This is important to know and recognize in order to catch an issue before it becomes a larger one. Rust in specific areas can lead to a failed vehicle inspection, which can prevent your car from being registered and driven on the road. To avoid this from happening, bring your vehicle to a local shop who can both diagnose and fix the issue.